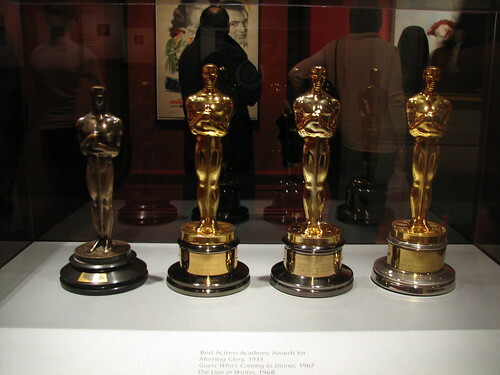 Katharine Hepburn’s four Oscars. I found this picture on Flicker so I have no idea when or where it was taken. I’m just a sucker for Oscars and plus, it’s shiny things….. IN journalistic circles it’s called “playing off the ball.” While the rest of the country was riveted by a one-of-a-kind inauguration and the first days of the new presidency, I was at the Sundance Film Festival, the Academy Awards nominations and the Screen Actors Guild awards. My peers were teasing out the semiotics of President Obama’s Inaugural Address while I hit the red carpets, asking people, “Who are you wearing?” (“My skin,” Kristin Scott Thomas said.) Hollywood is often accused of having little in common with the national narrative, and I had pulled duty as its wingman. But now that the inauguration is history and the grind of daily governance is under way, the Oscar campaign feels somehow less frivolous than it has in recent years. Still silly, but perhaps more purposeful. Yes, amid the relentless reports of layoffs and bailouts, recession and war, I’m going deep on whether there is a serious race for best actor between Sean Penn and Mickey Rourke. Is that actor race an issue of public, or even cultural moment? Maybe not, but in these dark days it is a handy and sometimes riveting diversion. 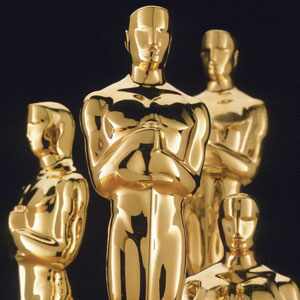 There is a spring in the step of those who are involved in the Oscars this year. After a strike-addled awards season last year, the frocks, the parties and attendant fuss are back. The Golden Globes, after last year’s glorified news conference had viewers tuning out in droves, managed to pull many of them back with this year’s star-studded show. The public seems ready not only to watch an awards show, but also to leave the house as well. Movie attendance so far this year is up as much as 10 percent and the box office receipts for the four-day Martin Luther King Jr. holiday weekend were up nearly 25 percent from last year. After the grim films of 2007 — a homicidal sociopath (“No Country for Old Men”) squared off against a sociopath who turns to homicide (“There Will Be Blood”) — this awards season has taken on a renewed lilt. Hey, there’s Kate Winslet, looking adorable, picking up all sorts of loot at the Globes. And look, it’s Meryl Streep managing to be both hilarious and dignified at the Screen Actors Guild as she accepts her best actress award. Even Mr. Penn, a person who clearly abhors pomp, was offering a serious, heartfelt speech at the same event. And Brad Pitt and Angelina Jolie whooshing by Ryan Seacrest at the Globes. Who didn’t enjoy the spectacle of all that celebrity? And the best-film nominees this year — give or take “The Reader,” which has the Holocaust as a central concern — reflect an appetite on the part of the Academy, and by proxy, the public, for a nice, big chunk of uplift. Take “Slumdog Millionaire,” the Cinderella by way of Bollywood. True, the film goes off against a backdrop of unrelenting poverty in India and a brutal scene of child torture, but it is fundamentally optimistic, with an anything-can-happen-and-often-does credulousness about a love that triumphs against all odds. Speaking of which, “The Curious Case of Benjamin Button” suggests, at its core, that love can conquer time and all its attendant punishments. “Frost/Nixon” casts journalism in a heroic role, as the means of bringing accountability and a measure of remorse from a president who chose self-interest over the national interest. And “Milk” is about a politician who chose precisely the opposite path, a man who by dint of self-sacrifice and unrelenting optimism all but created a civil rights movement that reverberates to this day. Consumers who are motivated by the laurels heaped on these films to plunk down increasingly scarce disposable income will leave the movie house with the message that circumstance is just that, and no match for the indomitability of human will. The films are built on individual successes — kids from the slums who better themselves, a television celebrity who finds his inner newsman, a newborn who overcomes old age and the midlife closeted man who steps into the light — that accrue to the greater good. That message, that darkness can be overcome by individuals working for the common good, is not so distant from the current collective impulse. Using the Oscars as a prism on national consciousness is a hoary, time-worn activity perpetrated by those of us who must find meaning in sometimes marginal work. But it does seem worth at least a mention this time around that both the Academy and audiences are showering love on such upbeat movies at a rough time in history. People looking for a window into the American psyche often point to the Super Bowl, which will be held this weekend. But a win by Pittsburgh or Arizona won’t say much about where we sit, nor will the luster of Bruce Springsteen’s halftime performance. For my money the Oscars’ focus on the filmed stories that have captured the public’s attention say more than the bounce of an odd-shaped projectile. Whether they reflect escapism, wish fulfillment or genuine confidence, the decorated films of this season seem to indicate that a country launched and kept afloat by a kind of collective fantasy is not ready to be overwhelmed by tall waves. And the truism born of the last national economic cataclysm in the ’30s still obtains: When people fear for their futures, they like to gather in a dark room and stare at a screen, holding hands against the gloom. A flood of childhood memories flows through my brain every time I drive on Talbot Lane. Monday morning I took the road again to my doctor’s office. I used to watch my relatives drive go-carts around the grounds of what later became known as ‘Rancharrah’ on Easter and the Fourth of July. I distinctly remember the sharp blades of grass piercing my back every time I fell down, the water rushing down the small concrete canals and the orange sunsets through the tall trees. I nearly grew up on that piece of land before it turned into the above picture. My father’s uncle was the caretaker for Bill Harrah’s ranch after he died in 1978. I kind of remember hearing about him, but I really didn’t understand what happened and why he was never there. We were never allowed in Bill Harrah’s home, but I do vividly remember the pool that wrapped around the house, and the cherub statues that flanked the edges. There was also a separate men’s and women’s changing room nearby complete with western-style swing doors. Three dirt parking spaces sat in front of the closed-blind one story. One day when I was a kid, Jack (the caretaker) asked us if we would like to take a tour of the grounds. Don’t know why he offered it, but I didn’t want to stay behind, so I went with my mother and several other people I really didn’t know. I am so happy I did; the land looks like nothing like it did more than twenty years ago. I never really ventured beyond the five? car door garage and small vineyard/orchard so I was surprised to discover a Model T and dusty gold-trimmed horse carriage in two small white garages, a white grand piano inside one of the 1940’s? era twin guest houses, the conspicuous plumbing that accompanied those homes, the basements and high beds. Jack periodically gave us several bucketfuls (literally) of tennis balls for our dogs. A tennis court was upstream from the barn area where some horse stables sat. I never really went to that area since it sat in the sun and was too hot for me. I just remember loud go-carts whizzing by all the time in that particular area. I didn’t know that much about the movie ‘The Reader’ until I recently read an in-depth synopsis of the film. Yes, it contained all the spoilers, but I wanted to know what all the hype was about. I unofficially picked Kate Winslet to win best actress this year, but I just wanted to know more about the story per say. I was surprised to read the back ‘love story’ that gels the entire piece together. It made me quite jealous; I want to write something like that. I hope I can one day. The imdb review flowed nicely and made it sense even though it was not presented in a chronological manner. I have a hard time making sense of what happened during World War II. But from a writing standpoint it sounds like it may be something to learn from – from scene structure to in depth character background. The ballots are in the mail for the 5,810 members of Hollywood’s elite who get to vote on the Academy Awards. Wednesday’s final ballots include nominees in 19 categories, among them best picture, director and the four acting prizes. Ballots in five other categories — feature-length and short documentaries, foreign-language film, animated shorts and live-action shorts — are available only after academy members verify that they attended screenings of the nominees. The deadline is Feb. 17 for Oscar voters to return ballots to the accounting firm PricewaterhouseCoopers. The big show itself comes five days later. The Screen Actors Guild has suspended plans for a strike authorization vote. A hard-line faction within the union and the guild’s president say the vote was likely to fall short of the 75% support needed to pass. The Hollywood group of actors, led by guild president Alan Rosenberg, is also recommending sending the movie studios’ final three-year contract offer directly to its 120,000 members for a vote. The declaration represents an about-face and follows months of preparations for a strike vote that would have given the guild the power to shut down production of major studio movies and prime-time TV shows. The last contract expired in June. With the unemployment rate ever growing across Nevada, I was interested to see how the rich community of Park City, Utah was doing during my annual Sundance vacation. I was somewhat surprised at the results. At first it looked as if nothing had happened: restaurants were still crowded, streets were filled with traffic, and hotels brimmed with guests. But upon closer look, there were some subtle signs the historical mining town was suffering from economic pains. For instance, the hotel we stayed at was somewhat empty. The adjacent parking lot was littered with prime spots. The Alpine Café on Main Street wasn’t crowded with cold journalists huddling around computers banging out stories for their news agencies. Even Robert Redford’s famous restaurant Zoom was open for lunch to (gasp!) commoners like me. It’s never open during the festival, only usually reserved for star parties. The one bright spot for Park City was and always is the ski resorts. Droves of skiers and snowboarders still piled into buses and vans (and condos) to enjoy the fresh mountain powder. I will admit my small world view may be skewed since I was, and mostly everyone else there last week, was a tourist so course we’d throng to tourist traps. Driving across the lonely (and snowy) Nevada desert I noticed other economic signs – shorter trains with less cars and less rigs traveling across state lines. Gas prices weren’t so bad (about $1.57) so it couldn’t have been that. But it just makes me wonder about our current situation you know?